I’m never one to turn down breakfast for any meal and I’m an especially really, really big fan of waffles. We didn’t eat a whole lot of waffles growing up (pancakes were more my family’s thing) but when I had to start buying my own groceries in college, you’d better believe that frozen waffles were almost always on my college budget grocery list. Right from the toaster, they were a quick breakfast I could eat on the way to class. 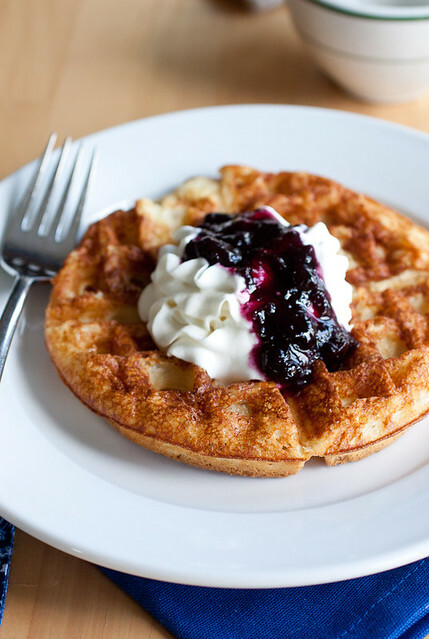 These yeasted waffles are sort of a sophisticated version of my college days favorite breakfast. While they are spectacular fresh from the waffle iron, I found them to still be outstanding reheated from the freezer. You’ll mix the batter together up to 1 day before you cook the waffles to allow the yeast to bloom and this set-up time yields a light and crisp waffle that will make you weep from waffle-related bliss. And for the record, yes, I definitely still grab a waffle on the go in the mornings for my ride to work. Some things never change! Prep this waffle batter the night before you plan to make waffles and give yourself a break from prepping breakfast in the morning. This works especially well when you have house guests or if you're hosting brunch. Whisk the flour, sugar, salt, and yeast together in a large bowl. Warm the milk and butter in a heatproof liquid measuring cup in the microwave just until the butter melts. Allow the milk-butter mixture to cool until it's warm to the touch. Gradually whisk the milk-butter mixture into the dry ingredients until the batter is smooth. Beat the eggs and vanilla together in a bowl and then whisk this mixture into the batter until incorporated. With a rubber spatula, scrape down the sides and bottom of the bowl to ensure there is no loose flour. Cover the bowl tightly with plastic wrap and refrigerate for 12-24 hours. When you're ready to make the waffles, heat your waffle iron according to manufacturer's instructions and then remove the batter from the fridge. Whisk it briefly to recombine the batter (it will deflate) and prepare according to your waffle maker's instructions. Keep the waffles warm directly on the racks of a 250° F oven while you make the rest. Freeze any leftover waffles on a wire rack then transfer frozen waffles to a large zip-top bag. When you're ready to reheat, preheat the oven to 250° F and warm the waffles through directly on the rack. Whisk the flour, sugar, salt, and yeast together in a large bowl. Warm the milk and butter in a heatproof liquid measuring cup in the microwave just until the butter melts. Allow the milk-butter mixture to cool until it’s warm to the touch. Gradually whisk the milk-butter mixture into the dry ingredients until the batter is smooth. Beat the eggs and vanilla together in a bowl and then whisk this mixture into the batter until incorporated. With a rubber spatula, scrape down the sides and bottom of the bowl to ensure there is no loose flour. Cover the bowl tightly with plastic wrap and refrigerate for 12-24 hours. When you’re ready to make the waffles, heat your waffle iron according to manufacturer’s instructions and then remove the batter from the fridge. Whisk it briefly to recombine the batter (it will deflate) and prepare according to your waffle maker’s instructions. Keep the waffles warm directly on the racks of a 250° F oven while you make the rest. Freeze any leftover waffles on a wire rack then transfer frozen waffles to a large zip-top bag. When you’re ready to reheat, preheat the oven to 250° F and warm the waffles through directly on the rack. I love yeast waffles! These look great! I LOOOVE how perfect these waffles look! Crisp and fluffy and just-completely drool-worthy! YUM. I need to make these immediately! I’m making them again this weekend for my dad’s Father’s Day brunch and can.not.wait! It seems that I’m always lusting after waffles too, Carol! We never had a waffle maker growing up (so pancakes it was!) but I just recently learned how much my mom loooves waffles and she FINALLY bought herself a waffle maker!